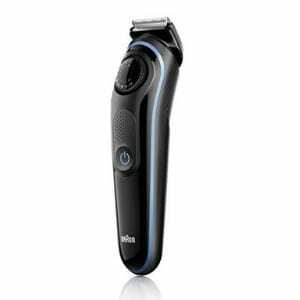 In this article, we are going to compare two different Braun beard trimmers to see which one is the best long beard trimmer and which is the best beard trimmer for stubble. Braun was always known for its electric shavers for when you don’t want a beard, but they also make some really good beard trimmers, too. Not all are created equal and each has its own strong suit. So to see which one you need based on length, we are going to compare the Braun BT 5090 and the Braun BT 3040. Long renowned for their electric shavers, people tend to forget they have been a go-to choice for guys with a beard for decades. For that period of time when guys were not rocking facial hair, or if they were it was stubble, the Braun beard trimmers took a back seat to the competition like Philips and Panasonic. When the beard trend emerged, it was like everybody had forgotten about Braun. Braun the brand has always been about innovation and taking care of all the small details, and that hasn’t changed. It’s just that now the Brain beard trimmers are getting recognized for being very good beard grooming tools with the reputation they deserve. 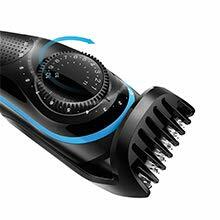 Let’s go into more detail about each of the Braun beard trimmers and see how they compare head to head. You get a very impressive 39 length settings with an easy to use dial adjuster. With the dial, you can set your length and keep it there, or rotate to have a multi length beard. This is great for when you want a beard fade. For bald guys, you can get a nice taper on the beard and sideburns to gradually taper down to the skin so you don’t have a hard line where your head begins. And you can do it one handed. You don’t need to change any guards at all for this. The lowest size setting is at 0.5mm and maxes out at 20mm. Unfortunately, even in the American market, Braun has decided to stick with metric and gives us lengths in millimeters instead of inches. 20mm is slightly less than an inch. There are two plastic guards that come with it to get you the length you want. The shorter one will give you 0.5mm to 10mm and the longer one up the 20mm. Power is somewhat average for the BT3040 Braun beard trimmers. Not that that’s bad, anyway. For most people you don’t need over the top torque and power to just trim a beard. But, that does limit how long and thick your beard can be. If your beard is too far past 20mm then it might struggle to chop it down. This keeps it out of long beard trimmer territory. Your best bet then is to go a barber and trim it to under 20mm and then use this to keep it at the length you like after. Edging is not ideal as it can’t get less than 0.5mm. This is slightly below stubble but won’t give a clean line. This is why they throw in a Gillette razor to help you keep those edges sharp. The blades are made out of stainless steel and are very sharp right out of the box. They should stay sharp for the life of the trimmer. Which if you have been reading any reviews already it might seem that this is not the case. Well, part of the problem with people who complain their trimmers are already dull were not taking care of them. They need to be cleaned of all the hair. Hair is quite acidic and even though stainless steel doesn’t corrode, it can end up affecting the sharpness of the blade. Then oil before and after each use and the blades will stay sharp. Battery life is quite good with an hour of use after a full charge. This should get you multiple trimming sessions before it needs recharging. The downside is that it takes 8 long hours to charge. So, if your battery dies you need to wait 8 hours to use it again? Nope. Just plug it in and use it as a corded trimmer. Seeing as how the longer plastic guard will only take your beard to 20mm, and it struggles on that length, it seems best when using the shorter plastic guard. So, rate this one as the best beard trimmer for stubble and don’t bother with it as a long beard trimmer. It works great for anything around stubble length to slightly above, but that is pretty much it. 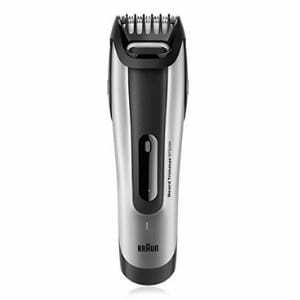 The BT5090 is definitely a step up as far as performance goes as it is fairly similar in many aspects to the BT3040 Braun beard trimmers. Sharper blades that keep their edge longer is the first difference. In fact, the blades can nick if you don’t pull the skin tight when using the lowest setting. This is not a detraction, it just means you have to pay attention because this is an actual tool and not pretending to be a trimmer. Even longer beards can be handled easily. For this reason, this one gets the nod as the long beard trimmer over the BT3040. You actually get less precision with the BT5090 than the BT3040 as it only provides 25 length settings. Again, this is not a detraction. With the shorter plastic comb attachment, the dial will allow you to set the length in 0.5mm increments, but the longer comb which goes to 20mm only adjusts in 2mm increments. This is fine since you probably don’t need that much precision on the longer settings anyway. Another feature missing on the BT3040 is the edger. On the BT5090 it slides out from the body so it is very ergonomic whether it is being used or resting. Truth be told, it is not very powerful. For light edging like sideburns or around the cheeks, then it works fine. If you have swirls on your neck where most beard can get gnarly, or the hair is really thick growing there, then the edger will struggle a little bit. For some reason, you can only go 40 minutes per charge with this beard trimmer. Though it only takes 1 hour as opposed to 8 like the 3040. It can also be charged enough in 5 minutes to provide for a one off trim of the beard if need be. And it can be used corded for added convenience. This is easily one of the best travel beard trimmers for the price as it automatically adjusts for different voltages. If you find yourself overseas, it can be plugged in anywhere and still work. Since the blade is so sharp and there is a bit more power, this definitely gets the nod for long beard trimmer status. It can do just as well a job as the BT3040 when it comes to stubble trimming, but shines when the beard is long. As far as which one is better overall, this is definitely a push. There are pros and cons that outweigh each other across the different features. The only way that I would give one a higher rating over the other is in how you want to use them. So as a long beard trimmer, that goes to the BT5090 without a doubt. It has the juice and the sharp blades needed to get through thick beards that the BT3040 can’t do. But the best beard trimmer for stubble is the BT3040. Not because it trims stubble better, in fact this is also a push as the BT5090 does an equally good job, but because I like how long the battery life is and the price is way lower. If you’re only going to be using it to trim your beard around stubble length then there is no need to splurge for the higher priced BT5090. Have you used either of these Braun Beard trimmers and would like to weigh in on the debate? Let us know by leaving a comment in the box below!